Do you know that reversing atherosclerosis by drinking pomegranate juice may be healthy for your blood vessels? This is exciting news considering that if the medical condition of atherosclerosis can be controlled or prevented, then the risk of stroke is reduced, if not eliminated. In order to understand how pomegranate juice may help atherosclerosis, it’s important to know how it occurs in the first place. Atherosclerosis is a medical condition also referred to as hardening of the arteries. In order to function optimally, the arteries in the body need to be open and healthy, allowing the blood to flow at normal levels through the body. Atherosclerosis occurs when plaque builds up in the arteries. Plaque is a combination of abnormal amounts of cholesterol, fat, and a myriad of other substances. The scary aspect of this medical condition is that no symptoms appear. Instead, a heart attack or stroke occurs before the condition is discovered. When this potentially deadly substance (plaque) builds up abnormally within the inner lining of artery walls and blood flow is limited, you have atherosclerosis. There are times when the plaque ruptures or breaks loose, causing harmful damage to the arteries or causing blood clots. If one of those blockages leads to the brain, a stroke occurs. The buildup of plaque can cause either a stroke or a heart attack. So, wouldn’t it be logical that less plaque is much healthier for your body? Amazing research on the effects of pomegranate juice on many health conditions is being led by a group of researchers and scientists in Haifa, Israel. A study conducted on whether or not reversing atherosclerosis may be done by drinking pomegranate juice was conducted on mice and humans. Both groups had a high risk for developing heart disease. 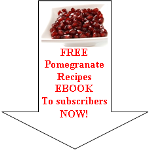 The humans drank 2-3 ounces of pomegranate juice per day for fourteen days. Another study found that a group of patients who already had plaque build up in their arteries benefited from drinking 8 ounces of pomegranate juice each day. The reduction of plaque was as high as 30%! That could mean that those people avoided the risk of a heart attack or stroke simply by adding the juice of a pomegranate to their daily diet. 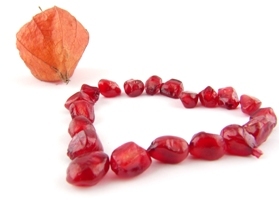 Is It True that Reversing Atherosclerosis may be done by Drinking Pomegranate Juice? Atherosclerosis is caused by what is called endothelial dysfunction, which is a result of an imbalance in the blood vessel. Research has shown that endothelia dysfunction can be inhibited by Vitamin A, Vitamin E, Vitamin C, Vitamin A, beta-carotenes, and carotenoids, all of which can be found in whole, healthy food sources. Pomegranate juice may because it contains all of the vitamins and the beta-carotenes mentioned above. The powerful antioxidants contained in this tart juice are also thought to reduce the effects of plaque build-up in the arteries. So, do you think then that the juice of a pomegranate could actually reverse this process of atherosclerosis? Read enough about reversing atherosclerosis and want to discover other health benefits of pomegranate juice?